Glaucoma is mainly caused by raised eye pressure. It is the gradual loss of nerve cells in the eye, resulting in a slow loss of vision until eventually the eye is blind. To date, dead nerve cells cannot be replaced. Loss of vision is therefore, as yet, permanent. It cannot be reversed by treatment. 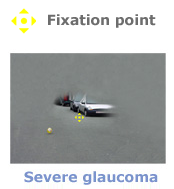 People with glaucoma rarely notice any symptoms until the disease is very advanced. This is firstly because you feel no pain. Moreover, you can read and perform most tasks for many years, because the visual loss is not a blurred vision. What is affected first is side vision or the visual field, which is the area an eye can see when it looks straight ahead. And what makes the disease actually treacherous is that the blind areas do not manifest themselves by black clouds. That is because these areas are being filled-in with the colors and patterns of the surrounds. Your brain is able to do that by use of visual information received from adjacent, still functional, nerve cells in the eye. Only after loss of a very substantial part of the eye’s nerve cells, the brain is not able anymore to compose a plausible image. Thus you are unable to realize you have the disease, up to the point where your visual field is narrowed dramatically and permanently. In the last stage of the disease central vision is also lost and the eye is blind. Both eyes are commonly affected, and one eye more so than the other. Although damage from glaucoma cannot be reversed, treatment can prevent nerve cell death and visual loss, if initiated in time. Early detection through regular eye exams of people who are at risk for glaucoma, is the key to protect them from visual loss, or to preserve their remaining vision. Only after loss of a very substantial part of the eye’s nerve cells, the brain is not able anymore to compose a plausible image. The images represent the visual field of a left eye. Underneath each image you can find the corresponding result of the visual field test (see Tests for glaucoma), where blind areas are represented in black. A normal test always shows one blind spot. Where the optic nerve is attached to the back of the eye, there is no retina and consequently no light perception (see How the eye works). Yet, no one perceives this blind spot because our brain is able to fill it in with colors and patterns of the surrounds. The brain uses visual information received of adjacent parts of the image to achieve this. In the same way, the brain conceals damage caused by glaucoma. In the image representing an early stage of glaucoma, the eye looks to the fixation point in the center. It does not see the children because these are practically completely located in the blind area. Still you are unaware of any visual problem, due to the filling-in process. Even in a later stage of the disease, the brain is still able to compose a plausible image. The deformations in the periphery remain unnoticed because you are unable to fix your eye on them. You are always looking at the center of the image, and when you shift your gaze to the periphery, the deformations move too.